Using floor tape is a great way to keep your facility better organized, safer, and in compliance with many regulations. Floor tape is an easy-to-use option that is fairly quick to install and can last for years without any significant problems. Floor tape is only a good solution, however, if it is used properly. There are some common mistakes people make when installing and maintaining their floor tape in a facility. Take some time to learn more about the most common mistakes that are made with this type of marking so you can avoid them. Applying to a Dirty Surface – The biggest mistake facilities make is trying to apply floor marking tape to a dirty floor. The dust and debris prevents the tape from sticking properly, which means it will start to peel up over time. Applying to a Painted Surface – If you have floor paint down, it is best to have it removed before switching to floor tape. The paint can crack and get pulled up, which can reduce the lifespan of the floor tape. Applying to a Wet Surface – If the floor is wet either from cleaning, a spill, or even excessive humidity, it can prevent the tape from sticking. Running a dry cloth over the area prior to applying can help avoid this problem. 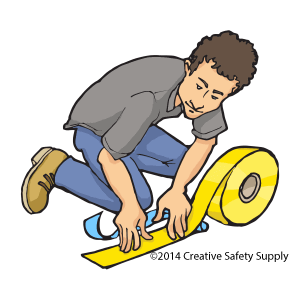 Using Indoor Tape Outside – When using floor tape outside, it is important to use tape designed for standing up to the elements. Not Using a Template or Guide – When using floor tape for long lines (such as aisles) you don’t want to just ‘eyeball’ it. While it may seem like you’re going straight, by the time you get to the end you’ll see just how off it was. Using a string line, laser line, or a floor tape installation roller is a great way to ensure it is all done correctly. There are many different floor tape marking shapes available that can be purchased at very affordable prices. These pre-cut shapes are ideal for many situations, and can be installed in just seconds. When trying to make similar shapes using just rolls of floor marking tape, it can be difficult and time consuming, and in some cases, impossible to complete. 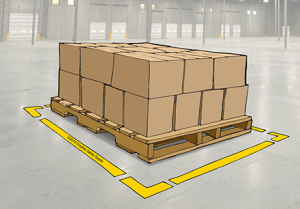 When you need to have floor marking shapes like dots, foot prints, corners, and much more, it is best to buy them pre-cut to the shape you require. In addition to saving a lot of time, it helps to ensure that the tape can be applied correctly since you don’t have to attempt to have the tape turn corners. 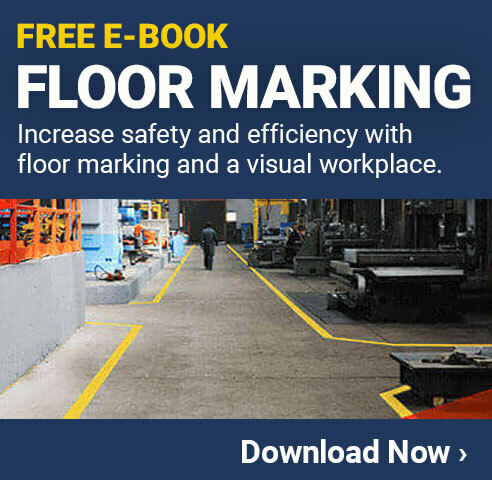 Choosing the right floor marking tape for the environment is something many people fail to do. In most cases, the biggest decision will be what color the tape should be and whether there should be any designs on it. This is an important decision, but in many parts of a facility, there will be additional questions that should be asked. In low light areas, many companies put down normal floor tape, which is then very difficult to see. Selecting the right tape for low-light areas is something many companies do poorly. For example, if they don’t use normal floor tape, they must use glow-in-the-dark tape. Glow-in-the-dark tape is great for some areas where it is light for most of the day, then requires a glow at night. It isn’t so good, however, for places that are always dark. Reflective floor marking tape, on the other hand, is ideal for these types of situations. The reflectors built into the tape make it much easier for people walking or driving through the area to see. To make sure you always choose the right tape for the job, Creative Safety Supply has created an online guide that will help you choose the perfect tape for your situation. You can find this Floor Tape Finder HERE. It will ask a few quick questions and recommend the perfect floor marking tape for your job. With the right planning and the right tape, you can avoid all the wrong ways facilities use floor tape and ensure your facility is properly marked today and for years to come. Next post Could You be Losing $500 in Tools Each Year?